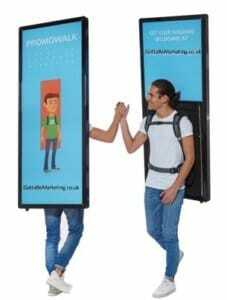 Advert Walkers are a unique advertising concept using a portable 1.2-meter tall lightweight billboard that is carried on the backs of our promotors. Double-sided, your advertisement is displayed on both sides and is the perfect addition to any field marketing campaign. Not only this, but the Advert Walker has built-in LED lighting, which can illuminate your message during nighttime campaigns or events that are inside. Unlike fixed and static advertisements found on billboards or on bus stops, the Advert Walkers can go wherever your target audience is located. Whether it’s London, Birmingham, Dublin or Newcastle, the Advert Walkers will maximise your brand exposure. They stand above any crowd and can be used at concerts, sporting events, fairs and festivals to name a few. This is one of the fastest growing forms of mobile advertising, targeting large numbers of people at any one time, as they can go anywhere our promoters feet can take them. What’s more Brand Ambassador who is wearing the Advert Walker can also hand out leaflets, samples or even collect data on tablets. When it comes to field and experiential marketing, it’s GottaBe! us. We guarantee superhero results, so make sure you get in touch now and let us plan your next campaign.